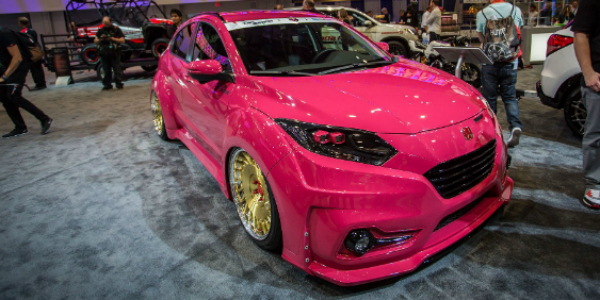 What Do You Think Of These 10 Self Built Cars At 2015 SEMA? This year`s edition of the Specialty Equipment Market Association (SEMA) Motor Show was among the best ever! It had a lot to offer, therefore it is not weird that people in the automotive world are still talking and writing about it! We are pretty sure that this won`t stop soon – as a matter of fact, the more the merrier! On the other hand, it was a great pleasure to be a part of such show and our goal is to share everything we saw at the Las Vegas Convention Center with you! You can find many videos recorded at the “crime scene” here on Muscle Cars Zone! Not only videos, but images are available as well. In this article you are about to see images of the 10 most debatable self built cars that were part of the 2015 SEMA Show. There are domestic and international vehicles as well. So, let`s review them. This vehicle is equipped with a wide body kit, one-of-a-kind paintjob and also an air suspension. However, with that paint we doubt that there will be men “brave” enough to drive this HR-V. Kind of looks like a chubby kid.